The cousins only produced two Ellery Queen stories in 1955, published in August and September. There were no novels published that year. 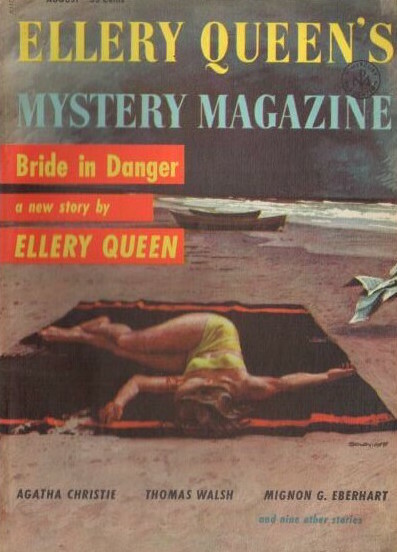 “The Bride in Danger,” in Ellery Queen’s Mystery Magazine (“Eve of the Wedding” in Q.E.D.) was one of their best from this period, and “The Blackboard Gangsters,” published a few weeks later in This Week, is one of the worst. This is almost enough to suggest they kept the better stories for their core audience, and threw their scraps to the millions of readers who read This Week. Of course, the caught culprit is another character altogether, with no motivation for murder, but up to that point, the story was very enjoyable.